A luxury safe that is finely fitted out, stylish and supremely fire resistant. Sophistication and security in one safe. 3.5 MM STEEL DOOR: Thick, reinforced door provides increased safety and protection against forced entry. 3 MM STEEL BODY: Thickness of the steel: 3 mm. 9 HINGES: 9 door-mounted locking bolts. PERMANENT AND REMOVABLE BOLTS: 1-inch thick active locking bolts on the top, bottom and right sides of the door. Permanent locking bolts on the left side of the door. UL STANDARD : American burglaryresistance standard. VDMA STANDARD : Browning safes meet VDMA 24 992 Level A standard. 180° DOOR OPENING ANGLE: The door opens fully, i.e. to 180°. INTERIOR LAYOUT: The stylish modular shelves can be repositioned up and down and from side to side. DPX SYSTEM : The DPX door rack system provides the storage solution for all hunting accessory items. REINFORCED DOOR: Profiled steel door frame provides even better protection against forced entry. AMMUNITION BOX: Safe includes a removable ammunition box. ELECTRONIC LOCK: Door is closed by an electronic combination. 3-SPOKE HANDLE: Safe comes with a chrome-finish 3-spoke handle. 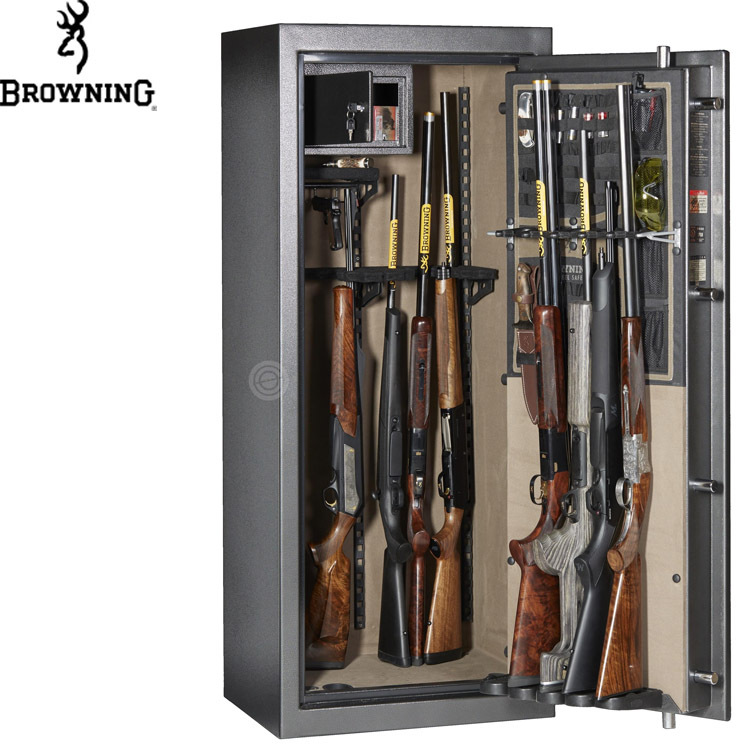 QUICK STORAGE: System offers quick retrieval and storage of guns in the door. FORCE DEFLECTOR: This exclusive system prevents the handle from being forced by causing it to spin freely if excessive force is applied. Price and Delivery: Please contact us for current price and availability.